From start to finish, this elegant wedding cake was pure enjoyment to make, primarily because I myself love the design and would have it as my own wedding cake in a heartbeat (if I did it all again, that is!). 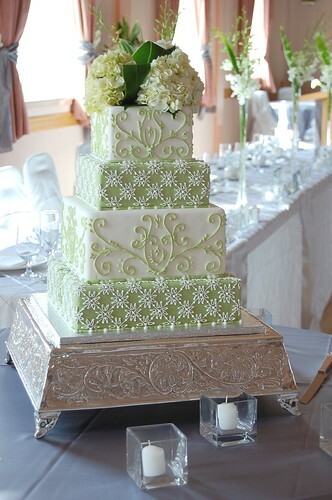 Jennifer and Sergio knew exactly what they wanted, a variation of this magnificent cake featured in Martha Stewart Weddings, but instead, with four square tiers in a refreshing apple/celery green and white colour palette. 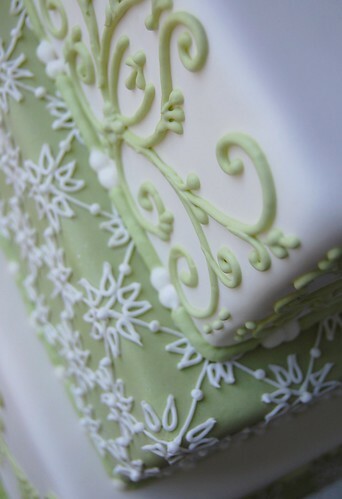 And because I am a self-described piping fiend, who loves nothing more than to sit for hours piping anything, having the entire cake covered with piped scrollwork and pattern was a challenge which proved to be more like fun than work. 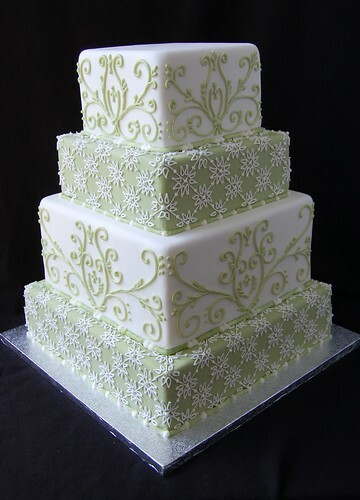 For the green tiers, I used a pin to mark each line before piping the grid and flower pattern whereas for the white tiers, the scrollwork was piped freehand. Even the flavour of cake is something I myself love! 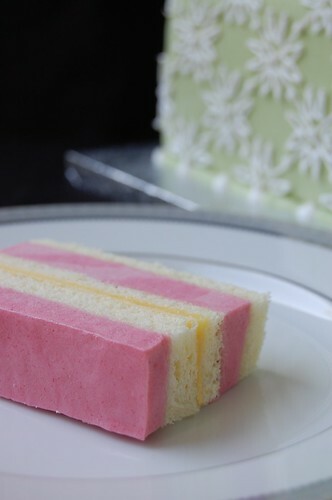 Sergio loves raspberry and Jennifer loves lemon so I decided to combine raspberry mousse, lemon curd, and charlotte sponge conveniently into slab form. 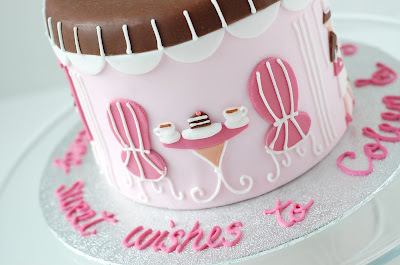 As you may know, I am a big advocate of display cakes because of the many logistical advantages they offer without compromising on quality and aesthetics. All this cake needed were three gorgeous hydrangeas to complete the bride and groom's vision. I was honestly so pleased with the final result that I couldn't stop smiling and taking photos of it. Congratulations Jennifer and Sergio! It was truly a pleasure! 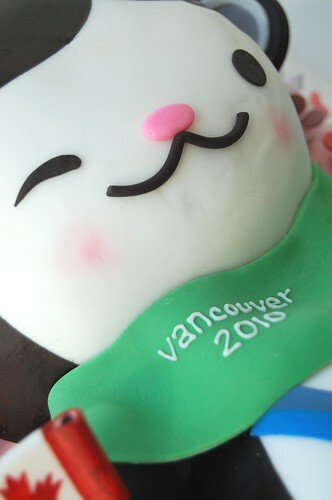 The Olympics may be over but last week, I was indundated with Vancouver 2010 memories. We went to the "Olympic asset recovery" sales warehouse just to poke around and came home with a snow shovel, tarp, clothing rack, two ice packs, two storage bins, and two items of clothing! There were odds and ends for sale ranging from plasma TVs to rubberbands, all of which were once used for the Winter Games. 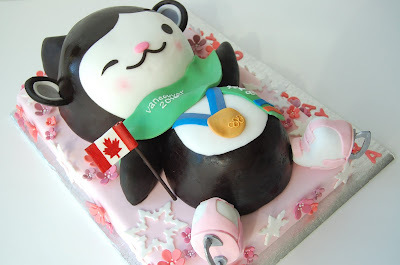 More importantly, Miga was reincarnated in cake form for a Miga-loving hockey/figure skating enthusiast named Kara. You may recall her Nemo cake from last year. 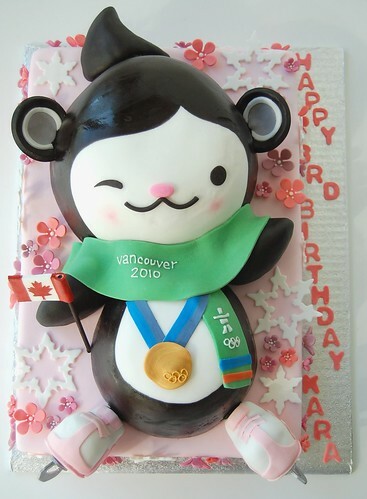 As one of the Vancouver 2010 mascots, Miga is part orca (killer whale) and part Kermode bear who is depicted wearing Kara's pink figure skates while waving her Canadian flag. My favourite detail was the gold medal, which I wanted to be as authentic as possible in its undulating surface and First Nations Raven design. Since I was crazy enough to wait over three hours in line to see and touch the medals, authenticity was a priority! Miga was constructed from two half-domes and rested on a low 10" x 15" slab of cake. 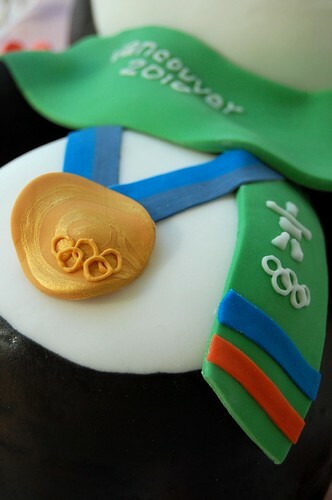 Alternating layers of chocolate and vanilla cake were filled with mango mousseline. Miga's three fins and skates were Rice Krispie treats. Cherry blossoms and snowflakes were added because, despite their seemingly contradictory pairing, cherry trees in Vancouver did begin to bloom during the Winter Games in February and everyone joked that it was indeed the Spring Olympics! Today, we might go and check out the former Olympic athletes village which is now on sale as luxury condos. Although marred with significant controversy, this waterfront residential development called Millenium Water is surrounded by new green space and is close to a great gelato shop which would make the perfect Sunday afternoon snack! 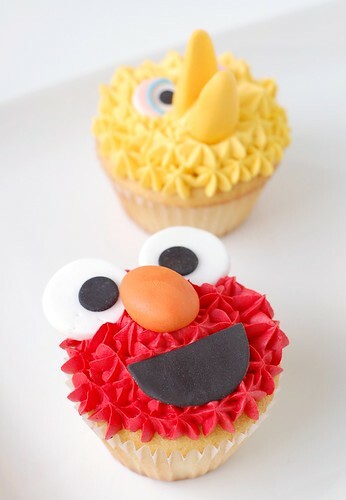 So when Winnifred asked me to make Sesame Street themed cupcakes for the children at the baby shower, I was excited even though in general, I am not a fan of cupcakes. Maybe it's because there are so many disgusting cupcakes sold everywhere everyday which turn me off, along with the routine massive buttercream tumour which some people love. We picked four popular hairy/feathery characters, Elmo, Oscar, Cookie Monster, and Big Bird in order to take advantage of the convenient star piping tip and colour combination. The face details were made from fondant and I admit that I spent an unnecessary amount of time focusing on their ocular appearance. 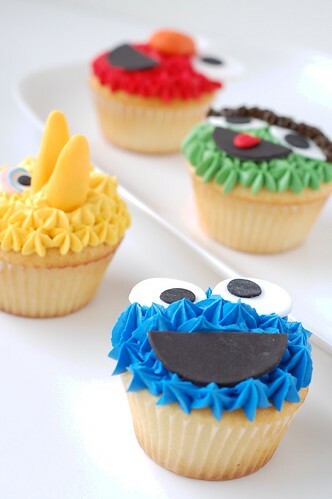 Oscar has the most healthy eyes while Cookie Monster has a severe skew deviation which he does not seemed too concerned about. 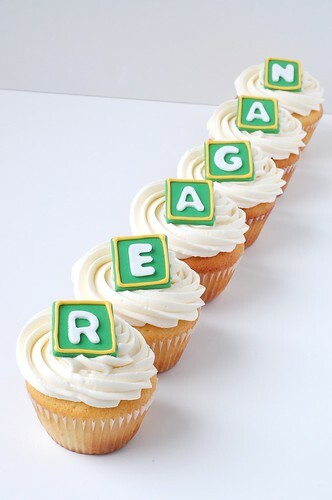 These goodies, including the macarons and cake shown in my previous post, were all for a guest who has yet to arrive named Reagan. She will be here soon and hopefully she will love beautiful sweet things just like her Auntie Winnifred. 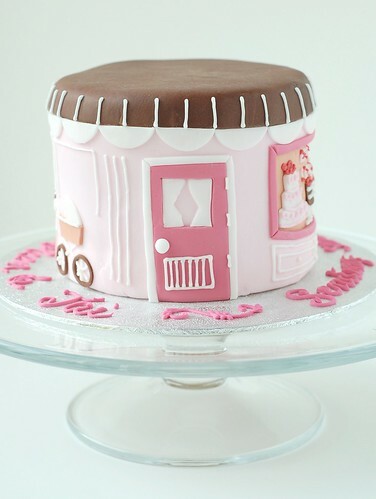 There is something about a cake with a door on it that is particularly inviting, I think. This precious pink creation was commissioned by my Haligonian friend Winnifred as a baby shower gift for her brother and sister-in-law. The yummy mummy-to-be is a fervent pastry enthusiast and Winnifred had seen this silly old blog post of a greeting card which served as the inspiration for this little cake. 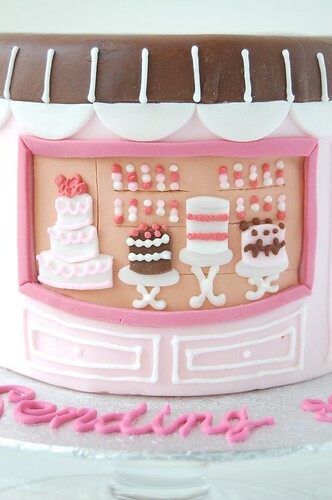 By little, I mean that this cake was only 5 inches in diameter and 4 inches high, meaning that all the details in each of the three scenes were tiny, the perfect challenge for an ex-ophthalmologist. At one point, I considered wearing my old pair of surgical loupes for more magnification. 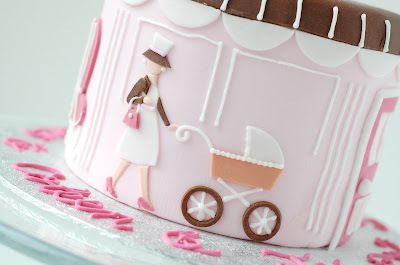 The chic mommy strolling along with pink pumps and matching purse was the most satisfying to make, especially because she was a mere 2 inches tall, excluding her hat. 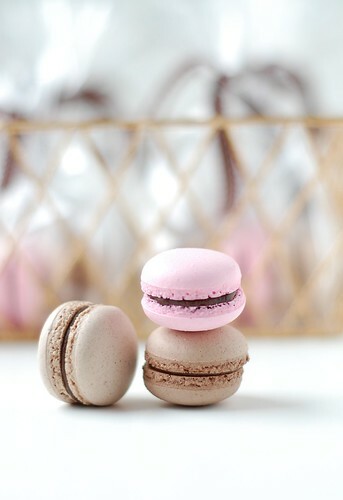 Next, the inset window showcased four petits gateaux with rows and rows of macarons in the background. This scene, plus having a co-worker just return from vacation in Europe, has made me think it is time to return to Paris for some major rejuvenation. Meanwhile, the actual cake was chocolate cake and chocolate mousseline with a crunchy hazelnut feuilletine layer.